The first quote my sister messaged me from Bunny Buddhism was this one about carrots. 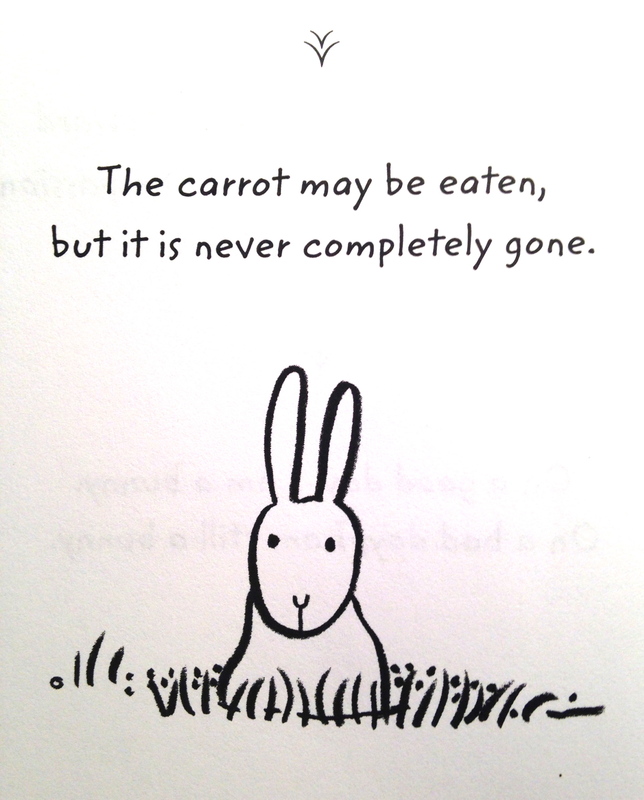 The carrot may be eaten, but it is never completely gone. Now, in terms of Buddhism-themed quotes, this one was admittedly not one that grabbed my attention immediately. It’s a bit abstract and not as easily applicable to my life as some of the others, so it was not one of the ones I marked. Still…as a first impression it was good enough. I knew I would buy the book because, holy cow, it’s bunny Buddhism. What could possibly be cuter than that? Penguins wearing knit sweaters? Babies and puppies napping together? 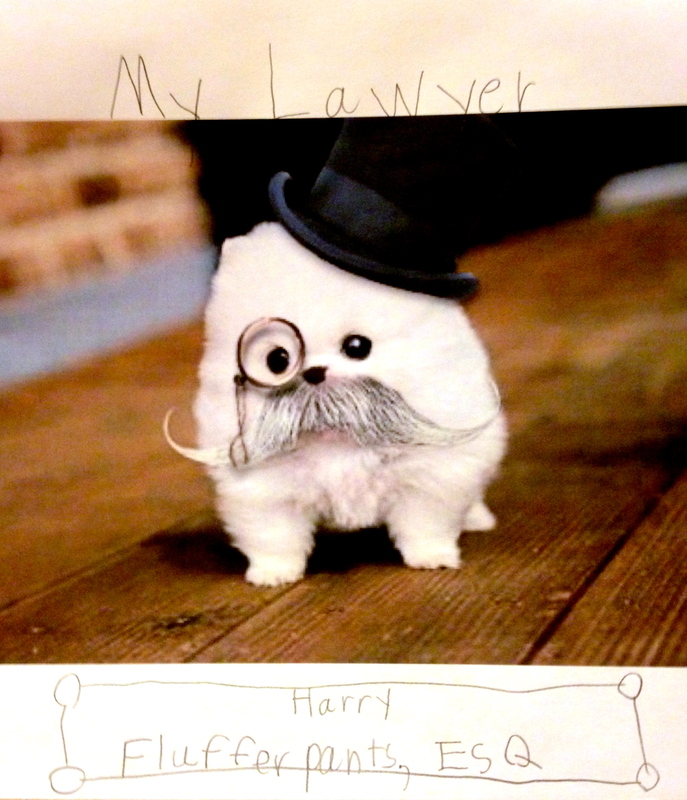 The only thing I had previously experienced that was nearly that darling was the lawyer our son Luke told us he’d hired, Harry Flufferpants, Esq. And you have to admit that a teacup Pomeranian wearing a black, satin top hat and monocle and sporting a distinguished handlebar mustache comes pretty dang close to deep thoughts about bunniness. Still…this particular bunny quote threw me, perhaps because I’m nothing if not pragmatic and I could not see the immediate wisdom here. I mean, let’s face it. If you consume a carrot, it is gone. Gone into the depths of your acid-machine stomach where it will in fact cease to exist in its current state. It will emerge later, but it’s not going to be recognizable and you’re not going to want to stop to reflect on it. Or at least I hope you’re not. So what exactly is the meaning of this quote? Although I’ve been sitting and reflecting on it for a while now, I am stymied. When I apply it to a life experience, like travel, I can make some sense of it. You take a trip and it ends, but the memory of that trip is never gone. You could also apply it to a person. You know a person and they leave you, but they’re never completely gone from your mind. Is that the lens through which you need to examine this widom? Perhaps the author was thinking of my husband who has an incredible memory for meals in obscure restaurants decades ago in foreign countries and would never forget an eaten carrot (even if he can’t seem to remember that I asked him to pick up carrots at the grocery store)? I’m drawing a blank on this one, and it’s vexing me. I never studied philosophy or religion, so I have nothing to go on. And I really hate feeling obtuse. As I was searching for an answer to this mental puzzle, though, I found this quote that might help. The wise bunny becomes wise by asking what he does not know. So, I am asking. Can you help me become wise? This one got me thinking:). One impression I have is that it has to do with the nature of truth and reality. What makes something real? What makes it true? Is it the thing itself, or simply our experience of it? The reality we think we experience is, at it’s heart, simply that–an experience. Illusory, yet nonetheless true for each of us. Some nuggets stick with me, and remain steadfast, time-tested. “I don’t know what it is that I don’t know.” is a rock of my foundation. Everything in the universe “is”, and has always been. The matter blasted forth in the big bang (or whipped up by a Creator if that’s your gig) has always been here. We’re talking atoms, even sub-atomic particles, collided, fractured, split and bonded. You, me, the trees, stars, bunnies and lawyers, that which we are made of…all of these particles have existed since the beginning, and go on existing regardless of their present form. Matter cannot be created or destroyed, only changed & modified. (Don’t let that statement get near Stephen Hawking or anyone else working on that event-horizon-of-a-black-hole thing).